TP Good View Bamboo i Koh Phi Phi, Thailand : Boka nu! What a view! Simply the best on PHI PHI. All bungalows have a great view of the water in front of our resort. View to Loh Dalum Bay to the Andaman Sea and even to Phuket. Sunset can often provide fantastically colors in the sky to the west. 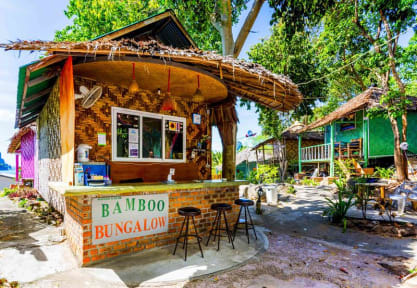 All bamboo bungalows have own balcony a big bathroom and are equipped with either a double bed or single beds for two or three people. Wifi is a must and we have free AIS 5G fiber net reachable in all rooms. We have kayak/canoe for a cheap rental.